Former Military Dictator in Egypt Hosni Mubarak was a US Puppet and was having strong relationship with Israel which benefited Israel greatly for decades. Now Rule of Hosni Mubarak has ended and people of Egypt are looking for a real change. 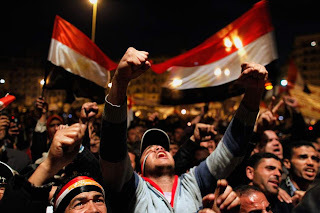 Egyptians also wants to end ties with State of Israel. According to a recent Survey that is done by synovate research group over 90% People of Egypt not wants relations with Israel. in the Survey many other questions where also asked by Egyptians like do they want Muslim Brotherhood In Government? 25% People said yes while most of people opposed this idea.